Some businesses prefer hiring software developers for the project directly, others seek help with professional IT consultancies. Both of these approaches are totally fine as long as you get what you need, i.e. high-quality software that meets your business requirements. Yet, in some cases, it is better to choose one approach over the other. For example, a professional IT consultant can compensate for the lack of internal tech expertise and project management skills. Looking to hire a pre-vetted specialist with proven experience? If you are at the crossroads and can’t decide if IT consulting would be the right option for you, think about it from the standpoint of the cost-benefit ratio. To get you started, we have compiled an overview of IT consulting average rates across the UK. But first, let’s see why businesses prefer to hire IT consultants. 1. Who are the IT consultants and what do they do? IT consultants usually provide expert advice and guidance in case the organisation lacks the required tech expertise in-house. They can help a company develop and implement a successful IT strategy or lead its digital transformation initiative. 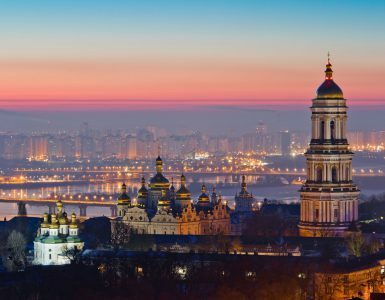 They work closely with the clients to translate their business requirements into technical specs and align them with the organisation’s strategy. They help assess potential vendors and get the required resources on board. IT consultants also ensure the in-house team is easily integrated with external developers from an agency. They define the scope of the project together with the vendor and voice its requirements. IT consultant also assist with preparing cost estimates in order to assure the costs are allocated appropriately. They make sure the requirements and deadlines are met by the vendor’s team. They keep the clients up to date with the development process by documenting the progress and presenting reports. Generally speaking, IT consultants can act as recruitment advisors, product/project managers, or even C-level executives. Yet, this doesn’t mean they can substitute the listed in-house specialists completely. Unlike in-house staff, an external IT consultant is expected to provide an unbiased opinion and help you make better strategic decisions. Plus, they usually have deep domain expertise (e.g. in automotive, healthcare, banking, fintech, or even blockchain technology) and vast firsthand industry experience, which makes hiring an IT consultant a reasonable investment. Unlike in-house staff, an external IT consultant is expected to provide an unbiased opinion and help you make better strategic decisions. 2. 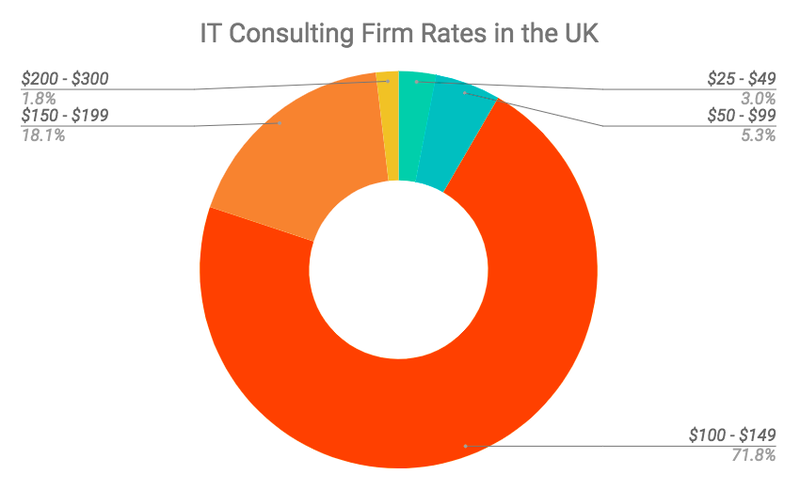 IT consulting rates in the UK. How much does it cost to hire an IT consultant? Just like any other salary, IT consulting rates vary greatly depending on a number of factors, including location, company size, employment type, experience level, etc. 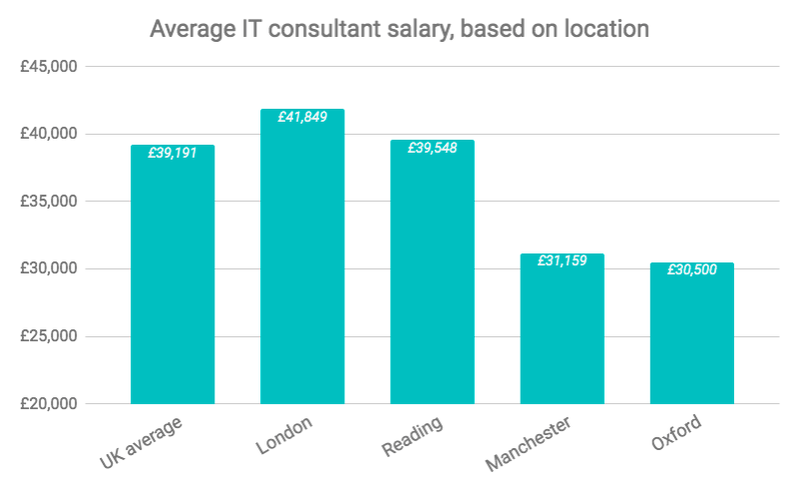 Here’s how much IT consultants in the UK get paid. What are the average IT consultant rates in the UK? According to reed.co.uk, the average salary of IT consulting professionals in the UK is £60,154 per year. Assuming that they work on average 1920 hours per year, IT consultant rates in the UK equal to £33 per hour. Salary comparison platform, payscale.com, shows similar figures. The national IT consulting average rates equal to £34.21 per hour. As for the median IT consultant daily rate in the UK, ITJobsWatch finds that it currently amounts to £488 (and is steadily growing). How do the IT consultant rates range depending on location? Quite naturally, the IT consultant rates in London are somewhat higher than the national average – almost £36 per hour. The difference between the highest and lowest salary offerings are more telling: £16 – £90 in London, compared to £9 – £72 countrywide. Glassdoor.com, on the other hand, finds that IT consultants in London earn on average £46,113 per year, which is 11% higher than the national average salary. 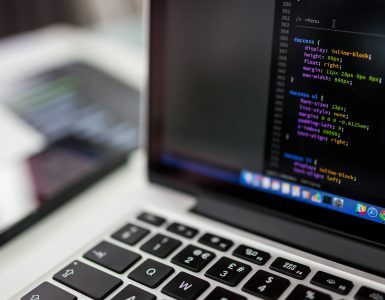 How much does it cost to hire a developer depending on technology? What are the IT consulting firm rates vs the freelance IT consultant hourly rates in the UK? Based on the data from one of the leading freelance marketplaces, Upwork.com the independent IT consultant hourly rates in the UK range from £30 to £130 per hour. The average rate is however on the lower side – around £55 per hour. As for the IT consulting firm rates, they also tend to vary depending on a number of factors. 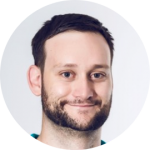 Judging by the data provided in the profiles of 684 IT consulting companies listed on clutch.co, over 70% of IT consultancies price their services at $100 – $149 (£72 – £107) per hour. Another 18% of companies offer IT consulting rates of $150 – $199 (£108 – £143) per hour. * Please note: It is uncommon to hire in-house on an hourly or daily rate basis. These rates are provided for sole comparison purposes. ** The rates are accurate only for 70% of IT companies in the UK. The rest of IT consulting firms might charge significantly more. However, bear in mind: Although hourly rates of the in-house employee are comparatively lower, you should always calculate the total cost in terms of annual rate while with independent contractors you always can agree on an hourly rate for a short-term project. As we can see, there are IT consulting rates to fit every taste. To make a sound decision, you need to choose which option works for you: an in-house employee working long-term or external contractor hired specifically for the project. If you choose the second option, hiring individual consultants makes more financial sense in the long run than partnering with a professional consultancy. On the other hand, full-time IT consultants working in-house offer more affordable rates, compared to freelance contractors. YouTeam offers a mixed approach, taking the best from both hiring an individual contractor and an agency. You get exclusive access to a pool of pre-vetted specialists with detailed profiles and proven experience across a wide range of domains. You can’t find these specialists anywhere else as they are employed and managed by top iT consulting firms. Working closely with some of the top IT consulting companies, we make hiring the best talent for your project fast and hassle-free. 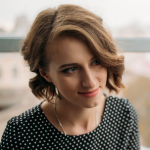 Just type in the technology required for your project, browse the list of available developers’ profiles and book an interview with a chosen candidate. Start working in days, not weeks. Freelance copywriter. Working in IT since 2014, I have a background in IT sales and marketing. 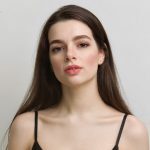 Passionate about all things tech, I сover a wide array of topics on business and startups, web and mobile development, IoT, blockchain, AI and machine learning, etc.